We help our customers and partners accelerate their digital commerce growth and monetize their audiences by connecting them to the most powerful content and distribution network to drive user acquisition and further the relationship between brand and customer. We help companies transform their business model and expand globally their digital commerce, meeting today’s requirements of agility, speed and scalability. Acting as merchant of record, we provide “peace of mind to our customers” as we tackle a constantly evolving legal and technical challenges. Our As a Service Solutions enable user monetization through any channel, such as Stores, InApps, Trials or Reseller networks and provide the operational infrastructure necessary to scale and comply with local laws and market requirements. We help you to sell services, software, games and content to local and worldwide audiences via a range of APIs and tools, including eCRM and marketing compliance. Benefit of smart, secure and personalised payment systems and services, giving you the time to focus on building great products and services. We connect retailers, marketplaces, services providers, publishers and content creators to one global business Network. 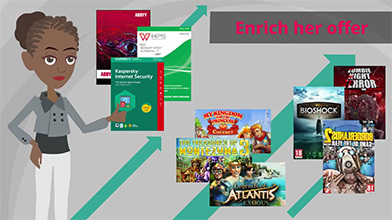 Our next generation API enables the sale and distribution of premium software, AAA and casual video games, digital content and services. Connect with our network to immediately add digital products to your existing store, monetize your audience with premium promotions, or take advantage of the number of services Nexway makes available via API to capture revenue. Trust our six years of experience in recurring revenue, optimized subscription replays and big data intelligence. Our systems manage the complexity of today’s modern engagement economy by empowering business models such as subscriptions and recurring contracts, consumption based models or virtual and fractional payments by meeting all the needs of legal and social compliance and best practices. Companies around the world rely on Nexway to manage and grow their digital business. Dive into our diverse use cases and discover how we help our clients to grow their digital business and power sales. Digital Commerce powered by Artificial Intelligence. Increase your conversion rates. Sell digital products and services faster, easier and more efficiently! Retain your customers in your own ecosystem! Get recurring revenue! Explore the Nexway libraries and toolkit! Access here to the Nexway product documentation. Start building your integration, explore the Nexway API suite for developer. Select from these options and we’ll route your request to the appropriate person and get back to you as soon as possible. Have a charge on your credit card statement from Nexway? Have you lost your license key or access code? We just need a little bit of info to get started. Tell us what you’ve got in mind and we’ll be in touch to help you reach your goals. Your company is using Nexway solutions and you need some help? Need more information about Nexway or looking for investor relations?